Once Called Bombay and its Afghan’s Church is also known as St John The Baptist Memorial which is Devoted to a British Soldier who died in one of the Afghans War during 1838. This Church was Made During 1847 AD at Colaba. It is Located at Colaba Causeway (i.e between Colaba and Old Woman’s island ) in Mumbai which was constructed by British East India Company. A person needs to get down at Churchgate Station which is the nearest in western Line and Take a Taxi/Cab ( Please also See the auto/taxi fare list Below) from there or bus to Colaba from Regal Cinema or Churchgate Station, which takes about 20 minutes. Alternately CST station is not to far and at equal distance like Churchgate. 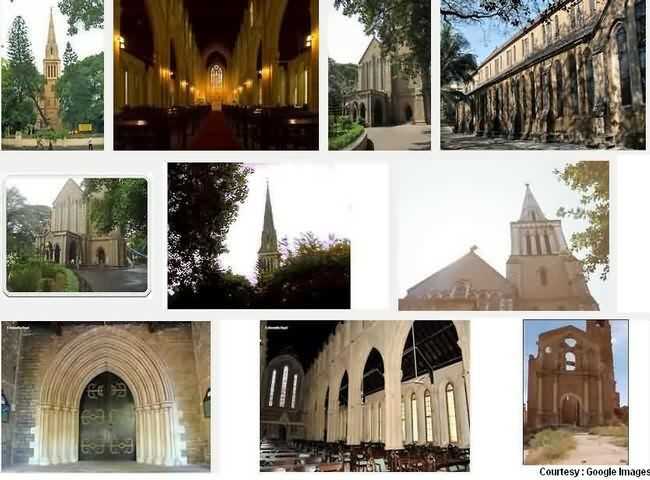 As said, Afghan Memorial Church is a tribute the Soldier’s who died in a Afghan Sindh War, This place is very old and has beautiful Gothic art works on glass and some lovely sculptures. Its a old Monument and On Mumbai Heritage list. Art work inside Church : A solid choir stalls have high backs pierced with open squares containing flowery rod iron designs. The altar rails and the supporting standards are of brass. Backing the altar is the striking stained glass window which greets viewers as they enters this location of church. Huge Ringing Bell : This bell amounts to total of 8 bells, Made by John Taylor which was donated by then a Colaba resident ‘Sir Charles Cayzer’ to commemorate his wedding. This bell is very huge and recently the blue Colour around the walls looks really good. Marbel Lectern : This beautiful piece of artwork came inside Afghan church is since 2nd may 1865 and still looks like an antique piece complimenting the surroundings. Beautiful Walls : Check around the walls, entrance and other locations inside and you can see the material used made up of Kurla stone. Its piers, arches, consignees and dressings are of Porbunder stones. Stylish Tiles : Imported quality of en caustic tiles can be seen on church floor, specially bought from England during 1903. See more attraction around Churchgate, Nariman Point, Marine Drive, RBI Money Museum, Regal Cinema, Eros Cinema, Flora Fountain, Fort Market, Fashion Street.